Protect your photos with the TSR Watermark images software, add logo, text or 3D watermark to your pictures, images, photos or other digital images. Batch processing when creating watermark. Transparent or solid watermark. 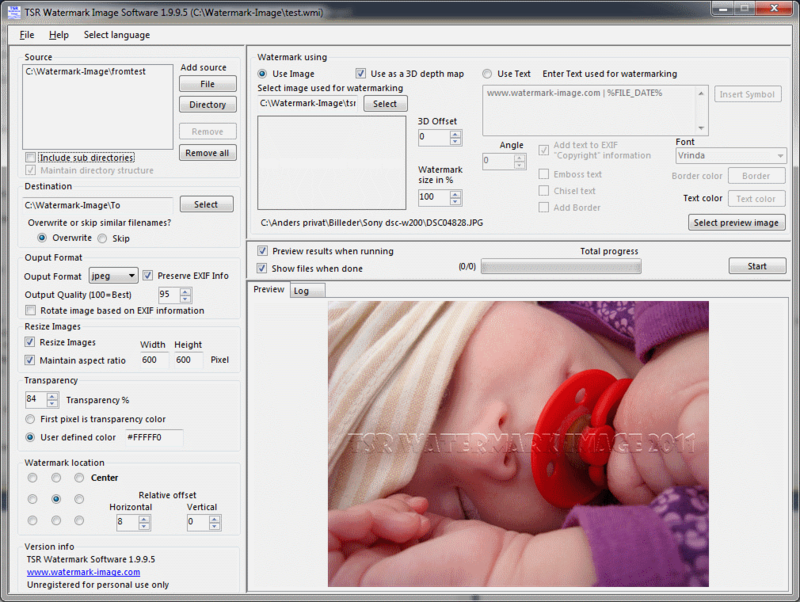 Free software for personal use to add watermark to pictures. How to watermark images, use this software. Use angled text used for watermarking. Keep the EXIF information when saving jpegs, and define your output photo quality. ...... Keep the EXIF information when saving jpeg photos, set the quality of jpegs, select the output image type (jpeg, png, gif, bmp, tiff). Automatically rotate the resulting image, based on the orientation tag in the EXIF information in the photo. Add copyright text to the EXIF information. Automatic preview the selected preview photo when changes are made to the setup. Create text watermarks with either embossed or chiseled text for a cool 3D effect! Qweas is providing links to TSR Watermark Image Software 2.0.4.1 as a courtesy, and makes no representations regarding TSR Watermark Image Software or any other applications or any information related thereto. Any questions, complaints or claims regarding this application TSR Watermark Image Software 2.0.4.1 must be directed to the appropriate software vendor. You may click the publisher link of TSR Watermark Image Software on the top of this page to get more details about the vendor.